There were quite a number of homesteader families living around Thunder Butte back in the 1920s and 1930s. Among the nearby settlements that had a store, a church, and which were places where one could pick up or drop off the mail, was a place called Brayton. Brayton was about two miles east of the Perkins County line, and maybe about ten miles west of Thunder Butte. In the early days, it was the post office for people living in the northwestern part of Ziebach County. According to records, A.L. Chase ran the general store there in 1916. There also was a Catholic Church that was attended by the Crowleys living at Thunder Butte. It was common in those days that the only "official" birth records were the records of baptisms kept by churches. When the church at Brayton blew away, so did any record of John Crowley's birth. John doesn't remember the name of the new church built at Glad Valley. Says John, "I think the last pastor was Father Now. He gave me a baptismal certificate when I went to California [to join the Navy] in l940. It was the only I.D. I had. I always remember the poor man with sorrow. He spent his entire life in New York City. The church then sent him out to this God-for-saken place [at least it would have seemed so to a New Yorker] to spend his remaining days. He had to carry his water from the Glad Valley store, which was about a mile down the hill. I digress, but I still have that baptismal certificate. He and I had to guess at the dates, etc., because the original where I was baptized, was blown away in a cyclone and all records lost." Whether it was a cyclone or some other kind of storm that flattened Brayton, extreme weather in the Dakotas was one of the facts of life that plagued the early homesteaders. John Corwin filed on a claim about a mile west of Glad Valley in 1910. The wind blew his first shack away. A windstorm or tornado struck Dupree in 1918 and blew down a number of buildings. 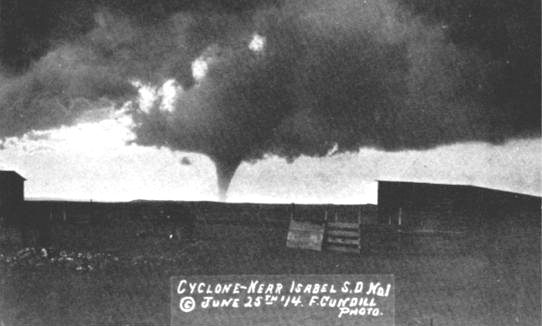 A twister was sighted near Isabel, in the adjacent county to the east, on June 25, 1914. Whatever the cause of the winds that blew Brayton away, the town disappeared from maps after 1924. From the old days, the roundup in the fall was one of those memories which brings a lot of nostalgia today. Clouds of dust from cowponies stomping their way through bawling herds of cattle, smoke from the branding iron fires and the stench of burned hair and flesh were a few of the things that are indelibly etched into my memory. The ranchers from all of the Thunder Butte country used to pool their resources in the fall and gather at our place for branding, cutting and sorting the herds. Then they begin the trail drive to market. I don’t remember many names from those days, as I was only about five years old. As I got a little older, the roundup had an additionally significant meaning, as it meant that school would be starting shortly. The roundup was, or it seemed to me, enjoyed by everyone. Except for a horse falling on somebody or getting run over by a steer, it went pretty smoothly. There used to be anywhere from ten to twenty men involved in this job, and my Mother cooked for all of them. I remember them sleeping on the floor, outside in the yard with their saddles for pillows, anywhere where they could crash after a long, tough day wrestling horses and steers. The next morning as the sun came, up my Mother would fire up the wood stove and start breakfast while this herd of men washed up and tried to limber up for another day in the saddle with a branding iron. About 1933, my brothers Joe and Neal, with the cooperation of many of the neighbors, gathered several thousand head of cattle for a drive into Nebraska. Because of drought conditions, hay was non-existent in Thunder Butte country. With winter coming on, all the ranchers were faced with starvation of their cattle. Someone scouted out an area in Nebraska where the grass was alleged to be up to the cattle’s bellies, so my brothers undertook the roundup and cattle drive into Nebraska. School was starting soon and I wanted to be a part of the trail drive, so I joined the drive for awhile. Once under way, the herd moved slowly with little grass to eat and water stops a premium. A few miles per day were all that were possible. There was the constant, ongoing problem of stray range cattle joining up with the herd or of groups of cattle breaking down fences. The biggest, almost insurmountable hurdle was the strays wandering off into the Badlands, as the herd skirted them. As we approached the Badlands, I ran out of time. School was due to start, so my brothers made me turn back. Joe and Neal stayed with the herd into Nebraska, through a winter the likes of which most people would as soon forget. Most of the herd died. Out of several thousand cattle, only a few hundred were brought back in the spring. The grass in Nebraska, which had been so lush and plentiful, it turned out to contain very little nourishment for these range cattle. That winter spelled the end for most of the cattle ranchers in Thunder Butte country, most never recovered. I don’t ever remember another big roundup. There were very few cattle left in the country and the ones that remained were only worth pennies on the dollar. The cattle drives were not the only big roundups in those days. About the same time my brothers were taking the herd into Nebraska, Merle Kelly, Boyd Hall, the McGinnis brothers and several others (Kirk Hall and, I believe, Gene Ulrich made up some of the riders) gathered up most of the range horses from Thunder Butte Creek, Rabbit Creek, and other areas, and trailed them to the Pine Ridge and Rosebud reservations. In case this doesn't seem like much of a job, consider that these horses were largely wild on the range. As Gene Ulrich reports, at times this herd stretched out across the prairie for four to five miles. This was, no doubt, a mind boggling adventure for these men, one that may not have ever been witnessed in history and quite probably will never be seen again. When I was about six years old, I more or less learned to read by reading old "Western" magazines. These were pulp fiction, dealing mostly with gun fighters and outlaws who rode the Western ranges. Well, I got the idea that a real man was one who “forked a bronc”* at an early age, took his whiskey straight, and never backed down from a fight. In those days, I used to sit on top of Thunder Butte and listen to the old steam train pull in and out of Faith. It was over 20 miles away. You couldn’t see the train but you could hear the whistle as it echoed across the plains. It was the most lonesome and mournful sound one could ever imagine. One day, on hearing the old train whistle as it was leaving Faith, I decided to ride into Faith and have a fling. A neighbor, Ruben Strong, had a magnificent red, pacer stallion, about 16 hands and a beautiful horse to behold. I asked Ruben if I could borrow his stallion for the day. He agreed and I rode to Faith. On my arrival in town, I rode up and down Main street a couple of times just to make sure the locals all got a look at the most magnificent saddle horse in the area. Next, I stopped in front of one of the saloons, ground hitched the stallion in front of the saloon, swaggered in, climbed up on a bar stool, and ordered a shot of whiskey. The bartender, without blinking an eye, poured me a shot, slid the glass over in front of me and waited for the results. I tossed off the shot, thought I would die, but never blinked. I just threw my silver dollar on the bar and swaggered out. It was the custom then for the cowboys to stop at the West Hotel, and Mrs. Joyce would run them a hot bath for twenty five cents, so that was my next stop. After a good bath and running low on money, I rode up and down Main a couple more times. Then, since the sun was getting low in the west, I started for home. I wish I could remember the bartender’s name. About a year ago, I heard that he was alive and well, and living in Las Vegas. He must be over a hundred years old now.